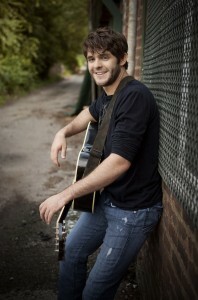 Thomas Rhett is taking the country music world by storm with his debut single “Something To Do With My Hands.” He was introduced to music at a young age, but the 21-year-old son of country artist, Rhett Akins, didn’t always plan to follow in his famous father’s footsteps. Country Music Chicago recently caught up with the rising star to discuss life since signing a publishing deal and find out where he wants this journey to take him. I know you grew up around the country music industry, but didn’t start playing country until high school. And even after that, you were focusing on careers that might have led to a more conventional future. What brought you back to country music? Thomas: I’ve always been a huge fan of country. Especially because my dad did country in the 90’s and is still writing most of the hits that are on the radio today. But when I was growing up, I had a little bit of a rebellion phase. In seventh grade I started a band called the High Heeled Flip Flops that I played the drums in, so I was more of a punk rocker, Led Zeppelin, Rolling Stones kind of kid when I was younger. I still am, but more towards high school I started to get back to my roots. Around tenth grade I picked up a guitar – not for the first time, but for the first real time. Dad taught me how to play a few basic chords and from there I started to teach myself how to play guitar and I would learn certain country songs that were on the radio. It still wasn’t a possibility for me to do country professionally, so I went to college wanting to be a physical therapist until I took my first kinesiology class and I hated it. I dropped that and I switched to a business major and finally ended up doing communications because it was the easiest thing my university offered. It was towards my sophomore of college when I was in a cover band playing fraternity parties and I got a chance to open for Frankie Ballard in downtown Nashville. It was that night where I got signed to a developmental publishing deal. I started writing and started to have a little bit of success as a songwriter and getting cuts on records like the last Jason Aldean CD. I got a Joe Nichols cut and a Scotty McCreery cut and I’ve got a couple on the next Lee Brice record. From there I started shopping around for record deals. I went to almost every label in town and everyone offered me a record deal. It was blowing my mind at this point. My last visit was at Big Machine. I sat down and played for Scott Borchetta, the President of the label, and he signed me after three songs that I played for him in his conference room. Now I’m on the Valory Music Company which is a branch of the Big Machine label group. So here I am with a song on the radio. I’m working hard trying to promote that song and I finish up the record in May. Its been a wild journey! Your song “I Ain’t Ready To Quit” appeared on Jason Aldean’s album less then a year after signing a publishing deal. How was that experience? Thomas: That was the coolest experience. Besides hearing my song on the radio, that was one of the coolest days of my life. I wrote the song with two other guys who also had never had a cut on a record before and we wrote this song not thinking anything really of it. I went and sang the demo and started pitching it around. I had heard the Aldean camp had heard it and I heard that a few people at the label liked it. I heard a few people at the label didn’t like it! I got on a plane one day to fly to North Carolina to go to the beach with my dad . When I got on the plane I got an email from my publisher saying, “Hey man, I’ve got some big news! Call me when you can.” I had to get on a plane and I knew that it was something big because he would never say something like that. When I landed, they said that they needed lyrics for Aldean because he was cuttin’ my song in the morning. I celebrated that day and that night and when I woke up my dad came into the room and it was Jason Aldean on the phone. He talked to me and he said, “I just wanted to say thanks for writing me a great song for my record.” When the album came out, me and 40 of my best friends went to Walmart and we all bought a copy of the record and just jammed that song out the entire night. It was very cool. You’ve been having a lot of success as a singer. Your single “Something To Do With My Hands” has been receiving a lot of great attention. What has the feedback been like from your fans when you play it live? Thomas: People are loving it. “Something To Do With My Hands” has definitely got a lot of great feedback not only from fans, but also from radio stations that are spinning it. We made an in-house music video when we played in Wichita Falls, Texas. That video is rockin’ on YouTube and its going really well, so I think people are responding really well to that song. Your album comes out soon. What can we expect from your debut album? Thomas: We are going back to cut and finish the record in May…and we will probably release the record something in August or September. It is very different. I cut my record with a guy named Jay Joyce who produced all the Eric Church records. I’m a diehard Eric Church fan and he is a big influence in the way that I write, the way that I sing and the way that I perform. Some of my big influences are a bunch of rap dudes and a bunch of old school rock dudes and some country music people, so definitely all three of those influences leak through into some of my writing. There is a song on there called “Front Porch Junkies” that I wrote with the Warren Brothers who wrote the “Red Solo Cup” tune that Toby Keith’s got out now. You can imagine the severe stupidity of the song called “Front Porch Junkies”! The record just rocks. I think we are probably going to have one or two ballads on the record, but other then that its going to be pretty rocking, pretty fun, pretty groovy, pretty in your face. Its going to be fun. We are looking forward to it! What else do you have in store for 2012? Thomas: 2012 is going to be a lot of visiting radio which is what I’m doing now. We started in January and we’ll probably wrap the official radio tour up in April. We’re doing a lot of radio shows, a bunch of big festivals in the summer and we’re hoping to get on a big tour in the fall. I don’t really know any names yet, but there are a lot of tours that are possible for the fall. So it is going to be a very strenuous, exciting, long year. I’m looking forward to it! I’ve read that you don’t really know where this journey is going to lead you and you are just along for the ride. Thomas: I want it to go as far as God wants it to go. I’m a huge believer and my faith means a lot to me. I’ve just learned…there is no point in trying to plan out where I’m going to be because its just pointless. Everybody is going to end up where they are supposed to be anyways. Whether that means I’m a big country music star or I fail miserably and become a songwriter. I’m open for anything and I’m just keeping my options open and hoping this thing takes off. If it doesn’t, it happens. I don’t really know where its going to go or where its going to end up, but the journey is what it is all about anyway.